Sadly, Dave Stevens was taken from us much too early in 2008. This book stands as a testament of his art. The book is 250 large beautiful pages big–the reproduction is flawless and best of all the book is only 49.95!!! You get to see Stevens’ creative journeys from initial sketches to finished art. Each page is an inspiration! 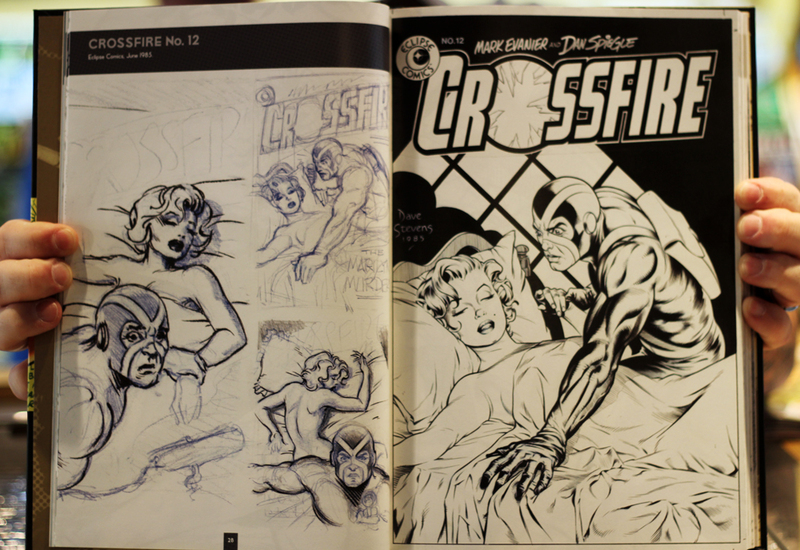 The book allows you to get inside the left side of the brain of one of comics greatest craftsman. This is my favorite comic book cover of all time. In fact when I was a single young buck who decorated his apartment with a stylish combination of plastic Milk Crates, furniture my mom wanted out of her house and myriad superhero memorabilia, a poster of this Crossfire cover adorned the wall of my front hall. That is until I got married when it mysteriously disappeared along with my Airboy coffee mug, Enterprise NC-1701D and Deep Space Nine Christmas Ornaments (and can you believe it–both lit up and blinked!) Still a mystery to this day. BONUS! you get all the covers of Jack Kirby Collector when Dave Stevens inked pencils by The King!! And still more: you get full page studies of Bettie Page, The Phantom Lady, King Kong, Sheena, Bettie Page, Mr. Monster, Hellboy, all the Covers from such comic series as Alien Worlds, The Shadow, DNA Agents and Airboy (yes, the same illustration that adorned my missing coffee mug-darn it) The book culminates with a section dedicated to Stevens’ paintings of Vampirella, Scorcher, and did I mention Bettie Page? Hmmm…maybe not, so just to be on the safe side…. Oftentimes, I hate dishing out a Franklin for a coffee table book that claims to be definitive and then the following gift-giving season, a new “expanded edition” is published. With Stevens passing, there sadly will not be any more cover art from this master of the craft. 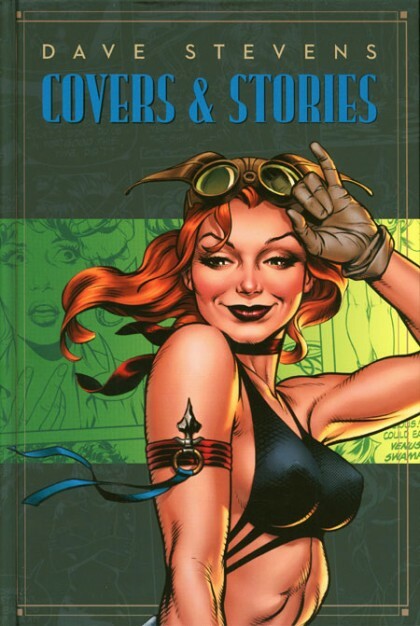 Dave Stevens Covers and Stories is respectfully designed to be owned and cherished and above all–studied! !–for the rest of your art-loving life. It belongs on your book shelf. I know I sound like a broken record, but if this article doesn’t convince you, pick up a copy of the book at the front of the store and start paging through. You won’t be able to part with it. You will buy it and you and your children’s children will thank me and my children’s children for it.